Tripping over roots and rocks? Struggling on hills? Lost your shoe in the mud? Then Learning The Trails might be the class for you. 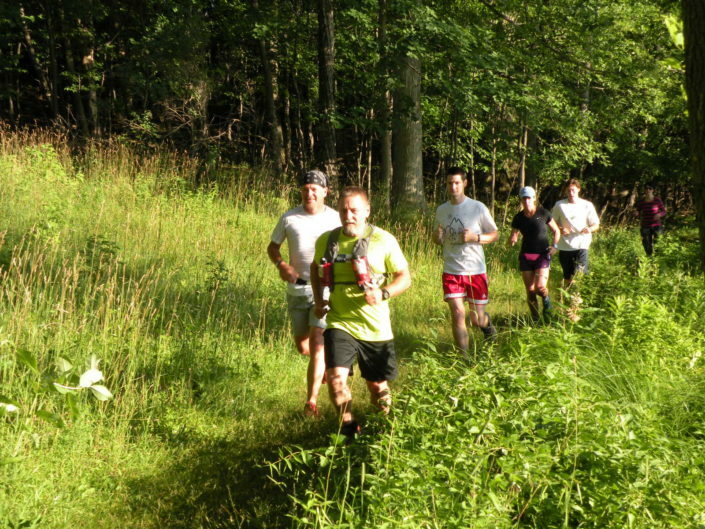 This course is designed to improve your trail running and as a result help keep you safe. The classes will have just a few minutes of lecture and discussion followed by short group runs. Runs will pause at different obstacles and challenges to discuss the proper way to successfully navigate them. Participants should be able to run a 5K without stopping. A goal for this program will be to have all runners comfortable running at least five miles on trail so they can participate in Medved Madness on May 5th in Mendon Ponds Park. Classes will be instructed by Dave Farrands. He has run many trail races both locally and out of the area in many distances including ultramarathons. Dave is well known among local trail running groups and is always willing to help other runners on the trail. He is looking forward to helping others discover the fun and challenge of trail running. Still have questions? Send Dave an email at Dave @ medvedrunwalk.com. $50 if you register before March 15, 2019 at 11:59 pm. $60 from March 16, 2018 until registration closes on March 31, 2019 at 11:59 pm. The next session will begin on Monday, April 8, 2019. Classes will be held on Mondays and rotate between Durand Eastman Park and Mendon Ponds Park. Be ready to run at 6:15 pm, regardless of weather. Please leave your earphones and your dog at home.